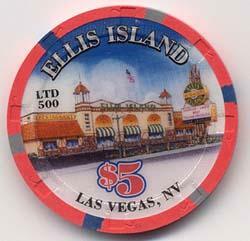 For year 2007 to celebrate the Big Game (Super Bowl), Ellis Island Casino created a limited edition casino chip. This rare $5 face value casino chip was minted in a very limited edition, only 500 pieces were made. We have set a limit of 4 of these rare collectibles chips per order. Each limited Edition Chips are in new condition.